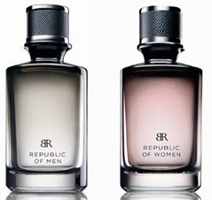 Banana Republic is expected to launch Republic of Men and Republic of Women in late August or early September. The new fragrances are for the "sportier, khaki-pants guy and white-shirt girl”. Republic of Men was developed by perfumer Laurent Le Guernec; the woody chypre features notes of clementine, plum, fig leaf, rosemary, basil, sage, hazelnut, sandalwood, cedar and creamy skin musks. Republic of Women was developed by perfumer Harry Fremont; the green fruity floral includes cassis, osmanthus, lychee, bergamot, peony, pink jasmine, Moroccan rose, lily, musk and precious woods. They could be marketed as (albeit late-in-the day) tie-ins to the Woody Allen film! The new fragrances are for the “sportier, khaki-pants guy and white-shirt girl”. Because of course, there aren’t enough of those out there. Sadly, I look deathly ill in white, so I guess I’ll be passing these by. “White-shirt girl”? I thought that’s who Tommy Girl was for. Probably, and many others as well. I haven’t had much luck with BR fragrances in the past, but the notes in “Bananas for Men” sound divine…..I love a good plum note. Hmmmm….we’ll see….. They both sound worth trying. Banana Republic W is one of my fave easy breezy go to frags. Bobbi Brown is quoted as saying it’s her favourite soapy scent & she wished she had created it! look forward to giving this a sniff. I’ll have to try W! Dear Robin, I personally doubt you’ll like W (at least the one for men), as it is one of those “clean laundry” scents. But of course I may be wrong. I totally disliked the latest from BR, like Malachite, Cordovan, etc. so I still have hopes for these, specially with the Fig leaf in the men’s . Thanks P, you’re probably right. I like the names too…didn’t strike me the same way they struck you though! they made me think of astronauts getting lost in another galaxy and crashing onto a planet with only men or women. Oh, yeah–I can totally see the sci-fi angle there! There was a Sherri S. Tepper book called the Gate to Women’s Country, or something like that. The Republic of Women could easily be the sequel. No, I’ll have to read those! When I was in my master’s program (years ago, admittedly) I didn’t get to read for fun, so I’ve been catching up on my backlog of books. I will have to add those to the list. LOL, I know. Didn’t separatism go out after the ’70s? I used to love BR Classic. In fact, I wish I still had some and may need to get a bit of that. Recent men’s offerings haven’t wowed me, but it’s still where I buy 85% of my clothes. I like Cordovan for men, and was looking forward to trying this one, but the hazelnut must be invisible for me to like it. Yesterday i smelled Givenchy Very Irresistible, and its hazelnut was horrifying to me. I keep forgetting Banana Repubic (intended) even has scents – I can’t fit into anything in there (well, sometimes something from the men’s department) so never go in unless I am shopping with a skinny-mini. Maybe next time that happens I’ll give some stuff a whiff, because there is sure nothing else for me to do in there. I am always very wary of Harry Fremont’s creations (L.A.M.B). And what’s with the “precious” woods here? Is that as opposed to plywood, OSB or some wood dust sweepings off the floor? Why, oh why did they do away with Modern? Am hording two bottles an American relation found at one of Florida’s monster discount malls. Flacon is (was) lovely, too–reminds me of Calyx (Prescriptives). I had never heard of it…what year was it from? Good question. I first picked up a bottle in the late 1990s (’97? ’98?) in Vancouver but I have no idea when it first appeared. A thousand pardons! Hey, no need to pardon…was just curious! And went to peek at Basenotes — they say 1997. Most grateful for the information–interesting! They Both Sound Wonderful… have never been disappointed by Banana Republic (first time for everything i am sure, but not as of yet) and these Sound great. LOVE OSMANTHUS and hope the women’s version is as scintillating as it sounds…. am already sold on the mens version! I love osmanthus too…we’ll see!